Propaganda films are, in principle, very clear about what message it should convey. One of the most notable example, TRIUMPH OF THE WILL is very efficient in transmitting its message. Images are designed to portray Nazi regime to be the liberator of German race, the symbol of national rebirth. Absurd, sure, but in 1934 Germany, an average citizen never knew the horrors to come. TRIUMPH is a very unique material. It is a rather dull document of the Nazi party political rally, propaganda to every frame. In Japan during WWII, any media, newspaper, literature, art, theater, film was heavily censored and monitored. The wartime government exploited news reports, news reels and other documentaries to express its agenda, to emphasize its moral ground, and to exaggerate its achievements. Several government functions and military ministries produced many so-called “culture films”. These documentaries were coupled with entertainment films so that general audience, who visited the theater for another Ken Uehara movie, would get government messages. In 1937, Ministry of Army decided to document the China war zone and under this political support, the director Fumio Kamei and cinematographer Kiyoshi Miki followed the troops to the Battle of Wuhan. The result was THE FIGHTING SOLDIER (TATAKAU HEITAI). This is one of the strangest propaganda films in the history of cinema. The Army wanted to make a good war propaganda, instead they got this ‘anti-war’ film. The film was banned and its negative was destroyed. In many literature and reviews, this film has been described as anti-war, anti-government or “weary of war”. I would say it is more complex. The film is largely silent with music tracks. Subtitles are effectively inserted with very heroic words, praising endurance and hard work of Japanese soldiers. But its images are filled with ironic gestures toward war, with clear contrast to sympathetic gazes to ordinary people, Chinese peasants and Japanese soldiers alike. The soundtrack is overly romantic string orchestra, overdubbed with canon blast and machine gun spatter. This film is filled with ambivalence. One thing this film efficiently does is to depict aimlessness of Japanese military actions. The film begins with the sad faces of Chinese peasants watching their houses being burnt down. I cannot recall any propaganda film opening with victim’s sad faces. And the sweeping tracking shot shows us the Japanese military station nearby. Mud-covered feet of exhausted soldiers and skinny physiques of military horses. This is not a troop of over-disciplined elite soldiers. They were ordinary Japanese peasants in shabby uniforms. Sanitary conditions are poor, water is undrinkable, and food is horrible, it says. Everything is much better in Japan than here. But they have to fight. The troops move up to the next front, leaving garbage and debris behind. Then, those Chinese peasants who lost their homes start to rebuild the village. Looking at this film seventy years later, we realize how badly equipped the Japanese military was at the time. Their logistics were largely dependent on soldier’s foot and military horses. Their tanks, cars and planes were completely outdated by ten to twenty years compared to European counterparts. But audience at the time, including war-time government officials and commanders did not realize that fact. They thought they were doing pretty well with those equipments. Fumio Kamei had been an enthusiastic film student and been to Soviet during 20s to study film technique, theory and practice. His communist/socialist leaning became quite evident in post-war works, but during the war his approach was more ambivalent. This was probably due to heavy sensors he had to face. Kamei carefully chose the text in the subtitles and images. The text was subject to scrutiny by the government officials, so he uses cliched expressions as if praising the cause. But he chose the images which can be interpreted in many ways. Or he relied on the viewer’s ability to ‘read’ the images so the irony and horror of the time would transcend, while he tried to trick on image-illiterate military officials by aligning their psyche with the subtitles. It is not that Kamei is making fun of soldiers. Rather, his keen camera is very sympathetic to those oppressed, used and abandoned. Soldiers spend the night in front of their comrade’s ashes. During this wake, they read the letter from the dead soldier’s wife, who of course did not know the tragedy. Even though many of the words in the letter are wartime cliche, her anguish transcends through, amplified by the excruciating irony. 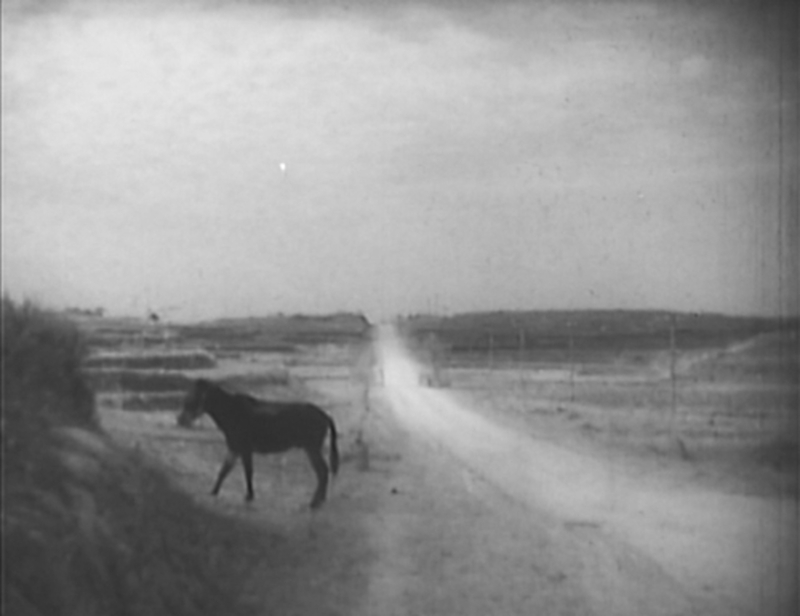 In another scene, a sick military horse is abandoned on the roadside. He collapses with exhaustion and expires. The camera captures this unforgiving reality with such an intensity you would never forget. Anyone who saw this count it as one of the most unforgettable images in the history of Japanese documentary films. The Fighting Soldier (1939) The staged Scene. According to Tadao Sato (1), the censorship office didn’t actually ban the film but asked Toho (the film’s production company) to retract the film. The official reason was not its “anti-war” message. Censorship officers said they didn’t like the fact that the film crew and the director staged the scene without the consent of the military high command. In the film, there is a lengthy scene of the Commander’s quarter, in which the commander is giving order to retreat and all the soldiers are saying “Yes, Sir” and running around (2). They said this is inappropriate because the film crew ‘used’ soldiers. The camera is stationary for ten minutes, ‘actors’ are mumbling written lines, and your attention would drift into these two dogs outside the quarter. This is a very very dull scene but Kamei staged the scene as if to say ‘This is fighting soldiers’. As you can imagine, you will not get dramatic battle scenes or heroic charges against enemies in real life. But, of course, they found this film was not obliging to the government official policies. It has been said that, during the screening, one angry military officer exclaimed, “This is not THE FIGHTING SOLDIER, this is THE EXHAUSTED SOLDIER!”. In 1941, Kamei was arrested and sent to prison as an “anti-government element”. Sometimes you encounter the film that demands you to contemplate your own view. Why do you find the scene of the exhausted soldiers cynical? Is it the director’s intention? Or is it you who think (with all the knowledge after the fact) these soldiers were fighting in vain? If you were living in 1942 Japan, do you think you would have felt as the same way as you are feeling now? By simply showing us the tragedy, exploitation, violence, sorrow, absurdness of human activities as they were, and silencing any vocal message, this film succeeds at reaching us and questioning our own view of the war. (2) In (1), Tadao Sato mentions the demise of this commander who “acted” in the film. After the war, this commander opened a shop in Shinbashi. He put up the photograph on the wall of him slaying a Chinese POW proudly. U.S. MP arrested him and sent him to China, where he was executed.